Is a no-fee product necessarily better than a product with a fee? I see heirloom tomatoes selling for $4.99/lb at the store. I’m not that crazy about tomatoes but I don’t cry bloody murder when I see the price tag. I leave those heirloom tomatoes alone and let someone else have them. I’m sure plenty of people buy them; otherwise the store will have to throw them away every week. 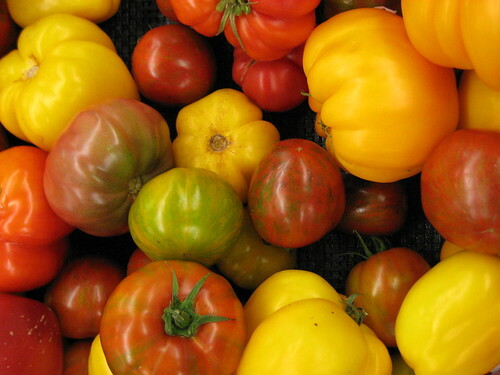 Those customers voluntarily pay the price because they value heirloom tomatoes. I look at the services I use. Many charge a fee when no-fee services are available elsewhere. I find that the services I use that charge a fee often deliver a better value than services that don’t charge a fee. Is it universally true that you get what you pay for? Of course not, but you shouldn’t automatically reject a service only because it charges a fee when other similar services don’t charge. Costco is one example. People pay a fee to shop there because it offers good prices. If you look at Costco’s financials, you will see Costco’s profit is largely from membership fees, not from selling merchandise. The “no shopping fee” at other stores are made up by higher prices. Fidelity Investments is another example. I have my solo 401k there. I pay $8 a trade when I buy Vanguard ETFs. If I move the account to Vanguard I won’t pay a fee when I buy Vanguard funds, but I will be limited to funds that end up costing me more in the long run because Vanguard only allows the more expensive Investor shares in its solo 401k. I pay an annual fee on a credit card I use often. I still come out ahead of the alternatives after paying the annual fee. Because most people are very much against paying a fee, businesses know they have to deliver value when they charge a fee for a service. When they have a hard time selling the fee product, they have to keep enhancing the value proposition, to a point where a fee-product delivers much better value than a no-fee product. Not always true, but it happens. On your point about buying Vanguard ETFs in a 401K. I thought that an Admiral fund (with a low threshold of $10K) and ETF were very similar – under what situations does that distinction (ETF vs fund) matter? For non-401K cases (IRAs or regular taxable accounts), should I assume that Vanguard brokerage account and Fidelity accounts would provide similar services? I am a Vanguard customer – so my main interest is to mainly learn what I am missing compared to Fidelity. Thanks. Sanjay – Vanguard does not allow Admiral shares in solo 401k accounts. That’s their way of charging for administering the solo 401k accounts, versus Fidelity charging commission on Vanguard ETF trades. For personal accounts (IRAs or regular taxable accounts), Vanguard’s brokerage account and Fidelity accounts provide similar services. See previous post Best Index Funds and ETFs at Fidelity. You see many best listed are actually Vanguard ETFs. Fidelity has better customer service and computer system in my opinion. I have money at both Fidelity and Vanguard. I admit to being irrational about fees (& taxes). I am a member of Costco and I shop there a lot. Last year I must have spent over $13,000 there, because my 2% reward check was $275. That easily covers the $100 Executive membership fee. So Costco’s fee doesn’t bother me a bit. When it comes to credit cards, I just don’t want to pay a fee. The rewards on the no-fee cards are very good and even though there are probably some cards with a fee that would edge them out, I just stick wih my Chase Freedom card. That being said — if I were a frequent flier — I would pay a fee to get one of those airline cards that lets you have a free bag, board first and get lounge access… Speaking of which, I do pay the fees to get a better seat on airplanes or when I fly Southwest, to get the A boarding group. Back to the irrational me — I work in downtown Chicago and live in the suburbs. Chicago recently passed a 5 cent fee/tax on bottled water. Now I avoid getting bottled water. When it comes to investments, I prefer no fees because I feel like I’m already taking a risk where I could lose money — paying a fee just seems to make it harder to come out ahead. Yea I think we are inherently scared of “fees” and flock to anything that claims to be “free” because it seems less risky to us. This is especially true if we aren’t sure if we are going to use said item/membership all that often. I’ve never joined costco or sams club because i’m always nervous i wont get my moneys worth since I don’t usually buy bulk items. I’m sure i’d get my moneys worth…but then i’d also feel obligated to use it as well since I payed for it so i might be buying more then i actually need.